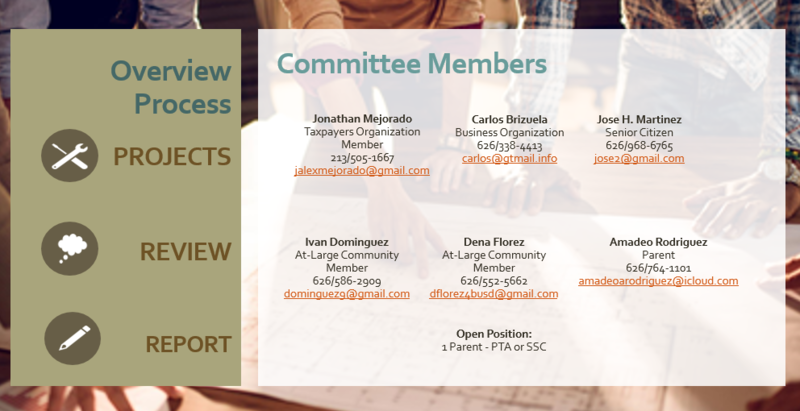 If you wish to serve on this important committee, please review the committee bylaws for more information about the committee’s roles and responsibilities and complete an application. If you have any questions, please call Linda Bermudez, Interim Executive Director, Business Services at (626) 931-3009. One (1) member shall be the parent or guardian of a child enrolled in the District. One (1) member shall be both a parent or guardian of a child enrolled in the District and active in a parent-teacher organization, such as the P.T.A. or a school site council. One (1) member active in a senior citizens’ organization. One (1) member active in a bona-fide taxpayers’ association. Two (2) members of the community at-large.